Favela Cubano / Hey, EEP! 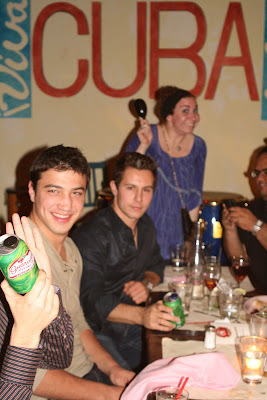 A dinner celebrating David Sharon's 25th birthday was held at the new Favela Cubano this weekend, hosted by the lovely Lee Levy. 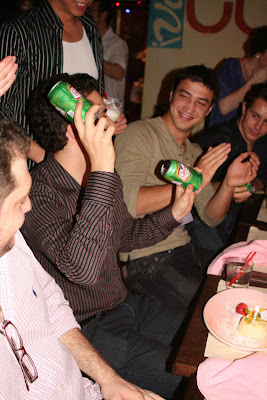 A spicy mix of good music, Cuban food & flashy decor gave the evening a festive twist only fitting for David's birthday. The vibe of the new resto was certainly eclectic. 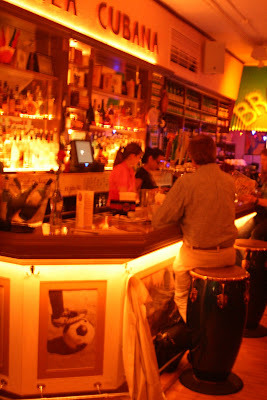 My favorite detail of the space were the drum barstools. Yes they really work! I jammed out on that man's chair just to make sure they were real. He wasn't very happy. Flavela Cubano was busy considering the fact that it only opened earlier this month. Either the place has developed a good following quickly, or the neon lights invite random pedestrians to pop in for a bite. Perhaps the place is even a little too busy for their own good. In the middle of our meal, the bartender quit from all of the stress! The waitstaff was clearly overwhelmed. As for the food, everyone really enjoyed their meals. Lee's cousin chose a dish with fried plantains on it, I believe it was a salad? It looekd beautiful. 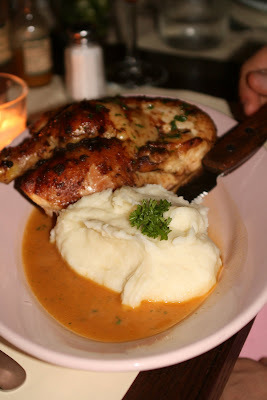 The roasted chicken was enjoyed by a couple sitting next to us. No worries, they were a part of the party. I haven't taken to randomly photographing other people's food. The chicken smelled fantastic. Look at that skin! Carrie and I split the Camarao A Baiana ; sauteed shrimp with roasted peppers, onions, tomatoes and coconut milk. I believe it was Bobby Flay who said that the test of a true chef is whether or not her/she can craft a beautiful sauce. Regardless of all of the other shortcomings at Favela Cubano through out the evening, the sauce in this dish was fantastic. The pepper and the onions melted into the broth of coconut milk and tomato. It was slightly sweet, slightly spicy, just an overall tasty dish. We were both very pleased! 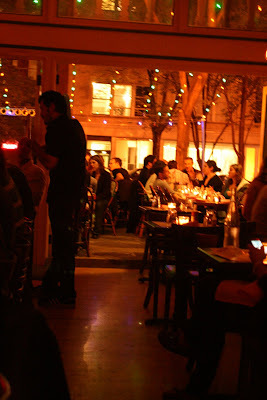 Overall I think we all enjoyed our time at Favela Cubano. I think i'd wait a few weeks before going back, just to give them a chance to work out the kinks...and maybe hire a new bartender. Maybe next time we'll go back from brunch. Check out their menu to see if they have something you'd enjoy and give it a go. One thing they totally got right was the "birthday celebration" portion of the evening. The staff turned on disco lights, absurd latin disco music and handed out home made maracas. Here is the lovely party planner and her cousin. Sounds like fun! Don't you with we all had skin like that chicken lol YUM! might have to check that out, where is it?